The Pelican Isle community is north of Naples at the west end of Wiggins Pass Road. 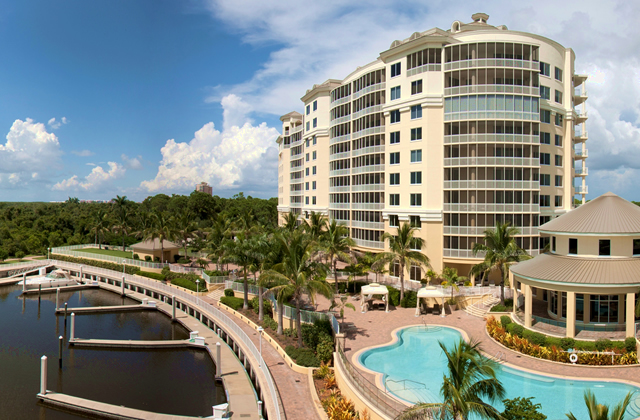 This exceptionally luxurious high rise community is actually on its own private, gated island – as in “entirely surrounded by water” – between Naples and Bonita Springs. Access is from Vanderbilt Drive or, of course, by water. Three 11-story towers are home to 136 Pelican Isle residences all with extraordinary, unobscured views of the Gulf of Mexico and Wiggins Pass, Pelican Bay, the Cocohatchee River, and Sanibel Island to the north. With floor to ceiling windows, the same views are available from inside as well. The latest addition to the community AQUA at Pelican Isle, which is just a few yards north on the mainland, but still on the water and with 29-foot boat slips, the majority of which are 50 or 55 feet in length. AQUA is, as the original three towers, 11 stories tall. Its grand entrance is just north of the Cocohatchee River Marina and a mere 500 feet north of the original Pelican Isle entrance. AQUA features a luxurious resort-style pool and an expansive deck for lounging and socializing. AQUA’s elegant two-story lobby is attended around the clock by professional staff. The building also has an amazing rooftop deck with a lounge, fireplace, kitchen, and spa. The main spa includes fitness rooms, saunas, and steam rooms. There are also private massage and treatment rooms. AQUA at Pelican Isle residents may also enjoy using the outdoor putting green or the indoor virtual golf and tennis. A dog run is available for four-legged family members. AQUA at Pelican Isle has four estate residence floor plans ranging from 4,500 to more than 4,700 square feet. Each has a private elevator foyer and two terraces, both more than 25 feet long, one facing east and one facing west. The sunset-side terraces are screened. Estate Residence #1 is a 4,700 square-foot, semi-circular layout with panoramic views and a grand salon just inside the entry foyer. The Marina Villas occupy 5,296 square feet in the same semi-circular layout, but with the addition of a Master Retreat in the expansive Master Suite. The Penthouse Suites occupy the top three floors and range in size from 3,900 square feet to 6,500 square feet under air. They feature terraces that run the entire length of the unit. Membership in the Pelican Isle Yacht Club is available to residents, but not required. The club offers additional amenities, including exclusive use of kayaks, canoes, and tennis courts, as well as exceptionally fine dining. Youngsters attend Naples Park Elementary, North Naples Middle, or Gulf Coast High School. Gulf Coast is the largest of the Collier County schools. Its mascot is the Shark, and it has received a silver medal ranking by U.S. News. Pelican Isle is an extraordinary retreat, particularly for those who love the water and who have earned the privilege of a relaxing lifestyle.